I found my transparency sheets! I knew I had a whole box somewhere! This set is called Heart to Heart from Lizzie Anne Designs. It's a fun set! Lizzie Anne Designs has really cool sets and I love the fact that they always include nice sentiments! I don't know if you can see from the photo (you can click on it to see it larger), but the out line says heart to heart to heart etc. I stamped it on a transparency sheet with White Stazon and slipped it under the round circle (made with the round tab punch). The whole frame is popped up with dimensionals to give it a nice finished touch. The designer paper is from the Jolly & Bright line by Heidi Grace.... my BFF. SNORT. LOVE her paper. It's absolutely incredible... beyond word description. You must touch it, then you can't stop..... or maybe that's just my problem. LOL. 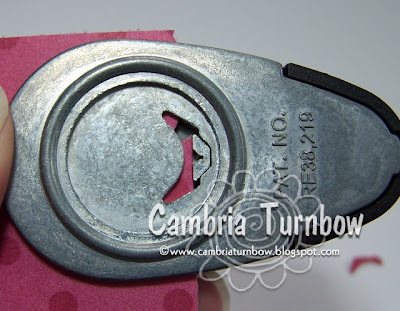 Other: Round Tab Punch, Circle Scallop Punch, Word Window Punch, Grosgrain and Tafetta Ribbon, Colored Brad, Crafter's Tool Kit, Dimensionals, Janome Sew Mini, Transparency sheet, Scor-Pal. Sorry about not posting yesterday. I was running behind. I had to get my Grandma to Eugene for her appt. at 9:30, which meant leaving here by 7:00. I was a few minutes late to pick her up, then I got pulled over in Reedsport (just a warning.... whew! ), then, we missed a horrible accident right along the Umpqua river by minutes! I think I was pulled over for a reason.... my guardian angel again. I haven't heard if the drivers were okay yet. Then, the Dr. was at a different office in Springfield and we got a little lost. We were only 15 min. late. Grandma had a good appt. I'm SO relived. I worry too much. I love that woman! My parents are home too... all is well. It was so nice to see them happy and rested. I can't wait to hear more about their trip later today. Hope you all have a great day! It's rainy here and suppose to storm later today. I need to brave the weather for a milk run. :) Thanks for stopping by!! Love this set from Lizzie Anne Designs called Heart to Heart! How much fun is this? I will totally use the heck out of this set. Lizzie Anne Designs is one of my favorite stamp companies. They pack so many stamps in their sets so that you have endless possibilities for cards, scrap pages and projects. I'm off to Eugene tomorrow to take my Grandma to her check-up with her cardiologist and to meet up with my parents! They are coming home! I know, I'm such a baby, but dang, I missed them. I'm not so sure that I like this retirement stuff if it means they are going to be gallivanting around all over for long periods of time. LOL. I had some leftovers from my workshop, so I decided to turn the paper over and use my Stem Silhouettes set. Again, I'm hooked on this layout I saw in dpeterson's gallery at SCS. I got a little carried away with my spritzer on the little card (4 1/4 x 4 1/4), but when I added the glitter with my glitter pen, it balanced out. I also mounted my Tres Chic background stamp that I've had and never used.... the tragedy. Love that background too. Okay girls... your last chance is approaching fast to get anything out of the Holiday Mini! Did you see what Nancy Morgan did with the chipboard? 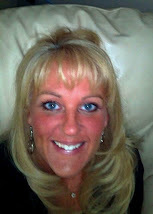 Check out Paper Smiles to see her awesome projects!! I have that chipboard too..... I need more hours in the day! I think I will make some glitter stars and add photos of the kids for our tree. They would love to do that as a family project. Check out the new promotion too Wrapping Up The Holidays! And, don't forget the Paper Party... you can never have too much designer paper!! Paper: Sage Shadow, Wintergreen DS Paper, Always Artichoke, Whisper White. Ink: Sage Shadow, Versamark, Always Artichoke Craft. Other: Large Eyelets, Crop-a-dile, White Taffeta Ribbon, Color Spritzer Tool, Janome Sew Mini, Scor-pal, Crafter's Tool Kit. Hi Cambria! I am grateful for my eyesight. Most it was taken when I was 2, due to a tumour behind my left eye. The surgeon should have taken my entirre sight,but he said he couldn't do that to someone so young. I have no peripheral sight & I have trouble telling how close/far away things are. But I manage ok! So, I am grateful for my eyesight so Ican STAMP & email all my fab friends..and use my SCORPAL!! Thanks to Kristi at www.hannastamps.com!!! I've sent her your address Sunshine and she will ship out your free "Things Hanna Would Say" stamp set directly to you!! I had so much fun reading all the entries.... thanks SO much for sharing with me. 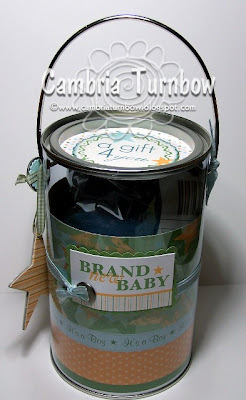 And, thanks again to Kristi at Hanna Stamps for sharing the blog candy with her design team. Hope you all have a wonderful day!! THANK YOU!!! My friend Jami issued a challenge. She was sweet enough to send me some images of this adorable little girl and the bird! I'm sorry I'm late Jami, but I LOVE this stamp and I thank you for sending me a couple images and including me in the challenge. Want to see what I'm talking about? Click here. Hope you all had a wonderful Thanksgiving. Mine was wonderful. Don't forget to scroll down and enter the blog candy give away. I need to draw for a name at 6:00 PST. I've had so much fun reading all your entries... thank you! 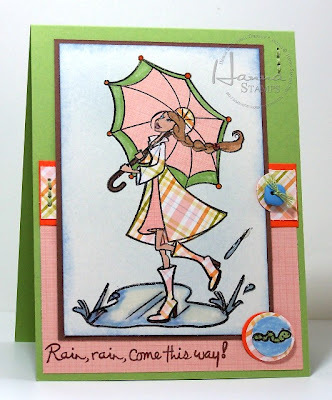 Don't miss out on a free set from Hanna Stamps!! Want to see more of the challenge at SCS? Click here. Man, they are all SO amazing!! Thanks again Jami girl!! Stamps: Elzybells, Flannel Plaid Background, Polka Dot Background, Short & Sweet, Wonderful Favorites, Festive Labels (Gina K.). Please click on the above.... and have a wonderful day! Whooo Hoooo!! 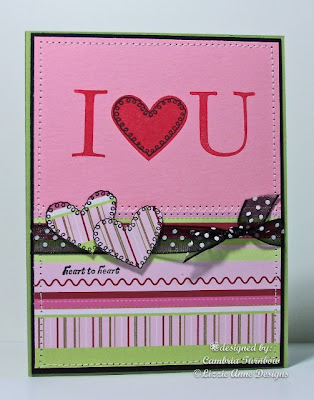 Hanna Stamps is coming out with a sentiment set! It's HUGE (set of 28) and it's all new!! Want to see a sneak peek of "Things Hanna Would Say"? Of course you do! Trust me, you'll want this set to go with your Hanna sets, and for sure for with the new sets to come!! We are celebrating the grand opening of the official Hanna Stamps site on Friday!! You can get this set FOR FREE!! Just leave me a comment about one thing that you are grateful for, or your favorite Thanksgiving dish/dessert/food. I will draw one name on Sunday evening and Kristi at Hanna Stamps will send you your new set! How cool is that? Check out the other design team members and their blogs for additional chances to win!! I'm thankful for so much this year. I try and keep reminding myself of those things as I struggle with my back and the aggravation of not being able to do all that I want to do. Most of all, I'm thankful for my family. I feel SO thankful that my grandmother has recovered from surgery and is healthy. I'm thankful my parents finally got to retire and they are having some fun. I'm thankful my family is healthy. I'm thankful for YOU and all of my wonderful friends. This year, since my parents are off on a cruise for their anniversary, we will have Thanksgiving dinner at my Grandma's house. I was going to attempt to make dinner myself (as scared as my kids were about that), but my Grandma wants to make a traditional English dinner for Thanksgiving this year. It should be fun, and we are all looking forward to trying some Yorkshire pudding. My good English friend sent me a recipe for a dessert that is traditional for holiday dinners, so I'm bringing that.... plus a pumpkin pie! My Mom is making a turkey dinner when they get home, but my friend Michelle said she would bring me some turkey for a cold turkey sandwich to hold me over! LOL. You have to have a cold turkey sandwich right? I hope you all have a wonderful holiday surrounded by loved ones. I want to send you all a big THANK YOU for your nice comments, your friendship, your support and love. You have no idea how much you make my days! Have you tried Qbee's Peek-A-Boo Box? What are you waiting for? They are so easy and SO cute!! That girl is PURE GENIUS!! Thanks so much Qbee!! 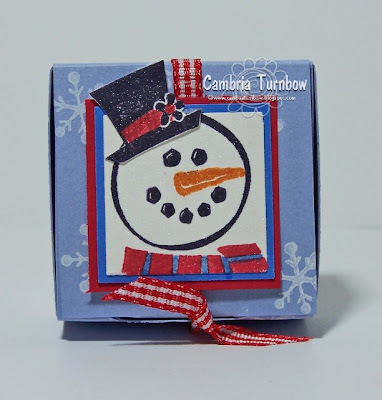 We made these little snowman poop boxes at my workshop on Saturday with glitter windows. It was great fun! I found a bunch of poop poems here. I messed around until I could get it to fit inside the square 1 1/4 inch punch. The poem is punched out with the 1 1/4 inch square punch, then layered on Ballet Blue punched out with the 1 3/8 inch square punch. That is layered on a piece of Real Red cut 1.5 x 1.5. Punch out the square for the window with the 1 1/4 inch punch, then cover from the opposite side with some packing tape. Then, dip in Dazzling Diamonds! Inside are Tic Tacs, but you can also uses mini marshmallows. To make the little frame, punch out a square on a piece of card stock with the 1 1/4 inch punch. Then, go directly over the top with the larger 1 3/8 inch square punch. Make sure you line it up straight before you punch it out. ***Tip: if you have the Scor-Pal, you can print out your boxes (two to a page) and then score before you cut them out. With the Scor-pal, you just line up the scor marks in a groove and go... two scored at once. I LOVE MY SCOR-PAL!!!! Other: Square Punches, Gingham Ribbon, Dazzling Diamonds Glitter, Packing Tape, Scor-Pal. Have a great week everyone!! Thanks for stopping by! 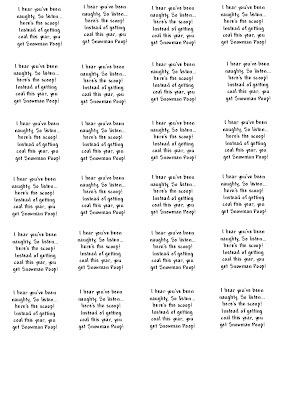 Here is the snowman poop poem formatted to fit in the 1 1/4 inch square punch. Click on the image to save and see it larger. I have it in a Word doc. too, but you'll have to email me. I don't think I can attach documents on Blogger. 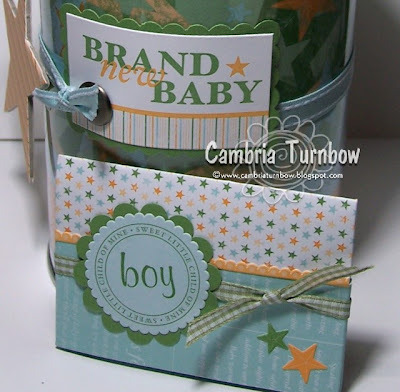 This month at Stampin'Up!, we are having a paper party baby! Buy three packages of Designer paper and get the the fourth for FREE. It's not too late to get in on this deal... better hurry though. My customers know how much I love Designer Paper. LOVE that it's two sided. You are FOR SURE going to like one side... the only problem is, I usually love both and can't decide which to use most of the time! LOL. This layout is based on a card I saw on by dpeterson (click on her username to see her awesbomb gallery!) 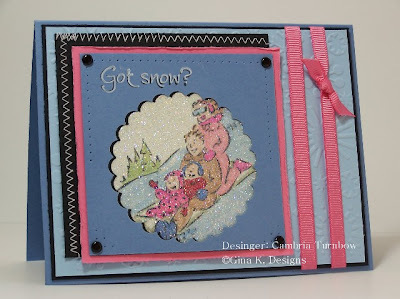 who was inspired by another card by my very talented friend Val Stangle. Wow... look at the Stem Silhouettes gallery for this set. Don't miss out on your chance to get Stem Silhouettes... contact your demo today! So.... I am hooked now on this layout. 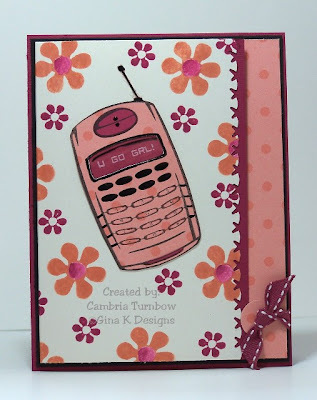 I wanted to show my customers how you can use the DS paper to quickly make very nice cards. Here is one with the set Season of Joy... another set from the mini you need to hurry and order if you don't want to miss out on!! So, if you cut your designer paper 4x4 you can get nine cards out of one sheet of paper. How easy is that? This is the same layout, just turned on the side. 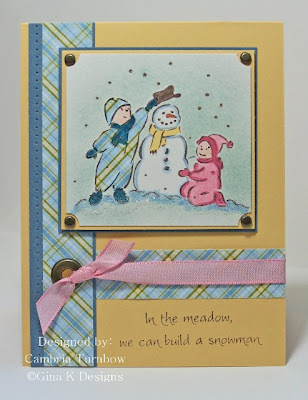 This card uses yet another set that is leaving us from the Holiday Mini called Love & Joy. I got it because it will be nice to use for other occasions besides Christmas. Paper: Whisper White, Purely Pomegranate card stock and textured card stock, River Rock, Holiday Harmony Designer Paper. Other: Crafter's Tool Kit, Dazzling Diamonds, Two-way Glue Pen, Crop-a-dile, Jumbo Eyelets, White Taffeta Ribbon, Dimensionals, Scor-Pal. Paper: Very Vanilla, Real Red, River Rock, Old Olive, Dashing Designer Series Paper. Other: Vanilla Grosgrain Ribbon, Crafter's Tool Kit (paper piercing), Dazzling Diamonds Glitter, Two-way Glue Pen, Ticket Corner Punch, Dimensionals, Scor-Pal. 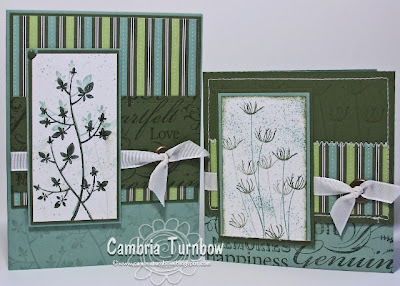 Paper: Sage Shadow, Whisper White, Handsome Hunter, Wintergreen Designer Paper. Other: 3/4 inch Circle Punch, Crafter's Tool Kit, Red Gingham Ribbon, Scor-Pal. Hope you all had a wonderful weekend. Thanks for stopping by!! LOVE the simply scrappin' kits! LOVE!! I got this can at Staples on the clearance rack. It's a bit taller than the Stampendous cans. The top of the can was stamped with the new label set from Gina K. Designs and punched out with the pink round scallop punch from Marvy. 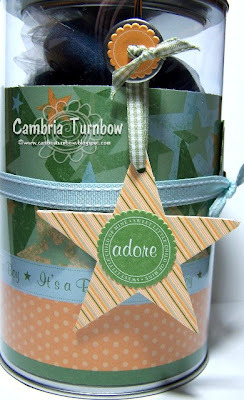 Man, I FREAKING love Festive Labels from Gina K.! Genius... that girl is a genius! 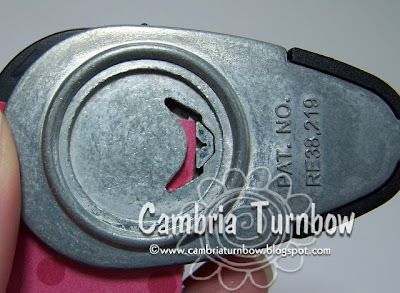 When I bought these cans, they had a little metal washer looking type thing hanging from the tag... I couldn't figure it out. Then, when I was taking it off to decorate the can, I realized they are to pry under the lid to pop it off! How cool is that? Of course, there were die cut stickers in the scrappin' kit to cover it and make it cute. Some of the die cut stars from the kit matched the star chipboard I had from Stampin'Up! How easy? I love cute and easy! Of course, who needs coffee more than new parents? Had to whip up a gift card to hold a Starbucks coffee gift card. You can find the tutorial here for the gift card. I'm still working on matching thank you cards from the kit. I'll share those when I'm done. So, I survived the MRI.. thanks for all the well wishes. It was really hard to be so still when you are in pain, but I closed my eyes and did not move. I don't think I've stayed in one position that long in forever. I got a break in between the back MRI and the hip MRI. Now, I don't go back until December 3rd... so it's more waiting. I can't tell you how much your comments and emails have meant to me... thank you! You can get the new Hanna set on Friday ladies!! It's my favorite set so far!! LOVE her hair! I messed up on the side with my paper piercing tool, so I got out some DMC thread and stitched! I like it..... sometimes mistakes turn out to be just the thing your card needs. Don't ya love it when that happens? Crystal Effects on the puddle... I just love touching it (when it's dry of course). 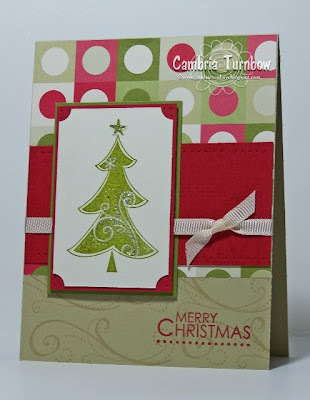 Designer paper is from Chatterbox (Villa Plaid). I had to make her boots match. My daughter has some like them from Gymboree. You are never too old to have matching shoes right? Other: Slit Punch, Circle Punches, Crafter's Tool Kit, DMC thread, Button, Mini Glue Dots, Crystal Effects, Scor-pal, Dimensionals. I'm off for a 1.5 hour MRI today on my back and hip. I'm not looking forward to it, but just want to get it done and over with. I really won't know anymore about what's going on with me until the results are back. Thanks to all of you who emailed me and left comments. Back pain bites FOR SURE! I just don't want another surgery. Hope you all have a wonderful Tuesday!! Thanks for stopping by!! I LOVE this new Hanna set..... it's my favorite so far! This little duck is too cute!! And, the worm? OMGosh. Crystal Effects makes the puddle seem real and of course I had to paper piece the umbrella. What a sweet duck! I love all the rain drops too. Frame is made with my Round Tab Punch and it popped up with Dimensionals. You can visit Paper Smiles for a tutorial on how to make the frame. Okay... sorry for the quick post, but I've got a ton to do today including my Dr. appt. for my back! Wish me luck! 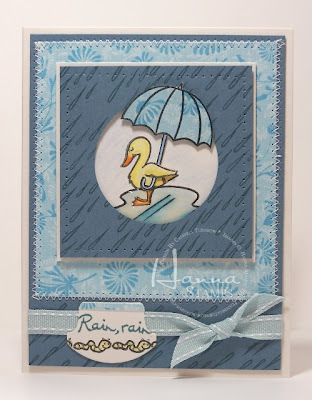 Paper: Blue Bayou, Shimmery White, Chatterbox Sun Canopy. Ink: Palette Noir, Stampin'Write Markers, Blue Bayou. 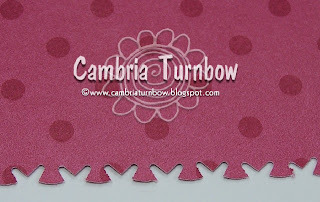 Other: Round Tab Punch, Blue Sky Stitched Ribbon, Dimensionals, Crytal Effects, Janome Sew Mini, Scor-Pal. I'll fill in the links later, have a great day everyone!! Thanks for stopping by! Gina K. is on FIRE with her new sets! I'm having SO much fun with all her new images! This set is called Text Messages. It has all kinds of text you can add to the phone. I cut the center out with a craft knife and added a window sheet behind it so that it looks like a real phone screen. I'm loving those flowers too! I adore girlie sets. 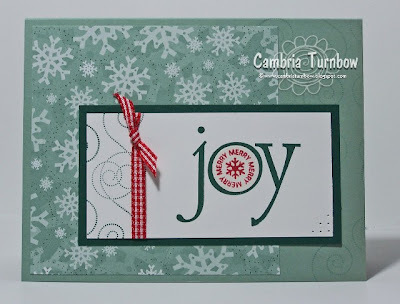 The edge is made with the corner rounder from Stampin'Up! You can see the tutorial here. The card is kept shut with the slit punch. The buttons on the phone are colored in with my Sakura Glaze pen. They are raised up and looked embossed. I love those pens!! Paper: Shimmery White, Purely Pomegranate Textured card stock, Designer Prints, Groovy Guava. Other: Window Sheet, Sakura Black Glaze Pen, Slit Punch, Corner Rounder Punch, Pomegranate Stitched Ribbon, Blender Pen, Scor-Pal. Hope you all had a great weekend! Thanks for stopping by!! I ordered mine!!! What are you waiting for? Bee Happy:Three(3) new bee stamps. I bought the Accents and Elements Build-A-Flower tin a long time ago.... just for quick easy cards and scrap pages. And, that's what I need... quick and easy. I discovered that some of the self sticking pieces in the tin, fit perfectly into the center of the Build-A Brads! How perfect is that? Kinda cute I think. I'm hoping to whip up a bunch more. Couldn't be any easier! And sometimes, we all need a little easy eh? Here's one more. Again, SUPER easy and under a minute to put together.. no kidding! Stamps: Much Appreciated, Short and Sweet. Paper: Shimmery White, Rose Red Prints Designer Series Paper. Other: Build-A-Flower, Build-A-Brad, Crafter's Tool Kit, White Taffeta Ribbon. Corner Rounder Punch. Take your paper and line up the very edge of the V in the center of your corner rounder punch (guide removed). If you want, you can start in the middle of your paper so that each end comes out equal. If so, just start in the middle and push the punch all the way in as if you are going to make a scallop edge. Continue with the following step. Slide the punch down and continue to line up the end of the V notch with the edge of the uncut paper. Repeat this step until you reach the end. Hope this makes sense with the photos... get a scratch piece of card stock and practice.... it's fun! Click here to see another sample. Sorry I haven't posted much this week. I've been struggling again with back issues. I see THE back Dr. on Monday. I'm hoping for a solution other than surgery and popping Advil like candy all day. It's SOOOO frustrating. Hope y0u all have a great rest of the week. Thanks for stopping by! The paper is Stampin'Up! 's Always Artichoke textured cardstock and Chocolate Chip. The designer paper is from BasicGrey's Mellow 6x6 pad. LOVE those papers. You can see a tutorial on how to make the little circle with your Round Tab Punch over at Paper Smiles... Nancy did a super job showing us this cool trick we were shown at Portland Regionals. Paper: Chocolate Chip, Textured Always Artichoke, Whisper White, BasicGrey Mellow Designer Paper. Other: Round Tab Punch, Round Circle Punch, 1" Circle Punch, 1 1/4 inch Circle Punch, Scallop Circle Punch (Marvy, yellow), Taffeta Ribbon, Dimensionals, Janome Sew Mini, Scor-Pal, Crafter's Tool Kit. Oh, yah... this is bright for sure! I ADORE these papers from Love, Elsie. The top background paper is embossed.... and it COMES THAT WAY! 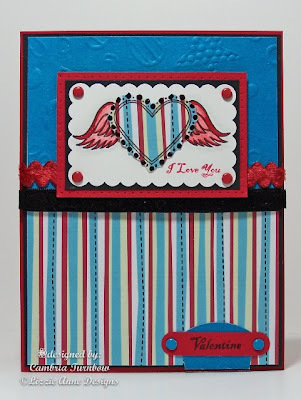 Stamp set is new from Lizzie Anne Designs called Heart to Heart.... tons of possibilities. I'm starting early for Valentine's Day. That way, I won't feel the pressure when it sneaks up on me. If you love hearts, this set is a must have. I love hearts... just saying (Hi Catie). The ribbon was a gift from my friend QC. I'm not sure where she got it, but it's beautimous. Thanks sweet friend! Paper: Real Red, Basic Black, Love, Elsie Paper, Whisper White. Other: Prismacolor Pencils, Gamsol, Blending Stump, Glaze Black Pen, Sakura Glitter Pen, Rectangle Scallop Punch, Colored Brads, Ribbon, Dimensionals, Round Tab Punch, Word Window Punch, Scor-Pal. Another new stamp set from Gina K. Designs! Her new site opens today... you must go and check it out!! This set is called "Got Snow?". This image was stamped on Shimmery White card stock, then punched out with the pink Marvy Scallop Circle Punch. Then, I ran the entire piece through my Xyron to make the front sticky, then dipped the image in Dazzling Diamonds. I punched another scalloped circle in the Ballet Blue card stock to make a window. Paper: Ballet Blue, Bashful Blue, Shimmery White, Basic Black, Regal Rose. Ink: Palette Noir Black, Stampin'Write Markers, Whisper White Craft. Other: Crafter's Tool Kit, Dazzling Diamonds Glitter, Pink Marvy Circle Scallop Punch, Vintage Brads, Regal Rose Grosgrain, Cuttlebug, Snowflake Embossing Folder, Janome Sew Mini, Xyron, Scor-Pal. Paper: Barely Banana, Ballet Blue, Shimmery White, Chatter box Designer Paper. Ink: Palette Burnt Umber, Stampin' Write Markers. Other: Stipple Brushes, Vintage Brads, Ticket Corner Punch, Dazzling Diamonds, Two-way Glue Pen, Taffeta Ribbon, Jumbo Eyelets, Crop-a-dile, Dimensionals, Crafter's Tool Kit, Scor-Pal. Hope you all had a fun evening... my kids had a blast! Candy hangovers for everyone!! Thanks for stopping by! !